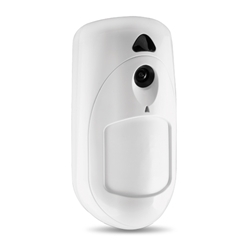 The Risco WiComm iWAVE™ Wireless integrated camera PIR pet motion sensor has an integrated camera for visual verification. Upon an intrusion event, or by homeowner demand, the camera captures and transmits a sequence of images directly to the homeowner smartphone application. The PIR/Pet Wireless motion sensor is a stylish wall mount passive infrared detector that can be added to your Risco WiComm Internet/Cellular Security System.